The Orchestra Sinfonica Del Festival Di Chioggia was established in 1997 during the Festival “Musica in Laguna”, held in Chioggia (VE).Since its creation, the Orchestra has collaborated with many renowned international performers, such as: K Bogino, S. Bogino, V. Ogarkov, M. Marin, R. Mussakhajaeva, D. Bogdanovich, M. Kugel, and R. Valeriani. In the summer of 1998, during the 16th Avellino International Festival of Orchestras, Orchestra Sinfonica del Festival di Chioggia performed with the renowned pianist Marco Fumo. This event inaugurated the first Concert Season of “Città di Chioggia”. Pietro Perini has appeared throughout Italy and Europe in many opera theatres conducting such productions as Bellini’s “La Sonnambula”, Verdi’s “Rigoletto“ (Treviso Comunale Theatre), Rossini’s “Il Barbiere di Siviglia”, (V. Emanulele Theatre in Messina and Treviso Comunale Theatre), Mozart’s “Mitridate, Re di Ponto” (Regio Theatre in Torino), Verdi’s “La Traviata” (V. Emanuele Theatre in Messina), Donizetti’s “Anna Bolena” and Mascagni’s “L’amico Fritz” (Théatre de l’Opera de Montecarlo). In June 1996, Maestro Perini conducted the European Union Youth Orchestra, which was broadcast by the RAI UNO channel, during the production of the show “Europa … mon amour!” which was the meeting of the ministers of the European Council held in Florence.Since 1997, he conducted with great success Rossini’s “Il Barbiere di Siviglia”, Donizetti’s “L’Elisir d’amore”, Puccini’s “La Boheme”, and Gluck’s “Orfeo ed Euridice”. In the summer of 1998 Maestro Perini opened the XVI International Festival in Avellino conducting the Orchestra Sinfonica del Festival di Chioggia. 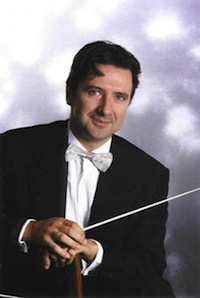 Maestro Perini conducted performances for the Rai – Radio 3, for the Radio Nacional de Espana and for Telenord. He has also recorded for the Edi Pan, Tring and Tactus record labels Maestro Perini earned his Bachelor degree in conducting, studying with Maestro G. Bewllini, Maestro D. Gatti and Maestro M. Benini and his Masters degree with Maestro E. Tchakarov, Maestro N. Rescigno, Maestro D. Renzetti, Maestro A. Campori and Maestro De Bernart. He also holds degrees in composition, electronic music, and as a pianist and harpsichordist. He was the winner of the 1993 ”Toti Dal Monte – La Bottega” di Treviso Conducting Competition and worked at the Opera Festival for the Teatro Comunale di Treviso as the assistant to Maestros Peter Maag and Evelino Pidò.